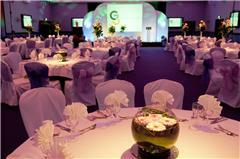 Carden Park, is set within a stunning 1000 acre estate, in Cheshire. Since the £6million refurbishment Carden Park has fast become widely known as one of the UK's finest country hotels. With 196 bedrooms, a choice of dining experiences, extensive leisure and spa, two 18-hole Championship golf courses including the Nicklaus course, 17 meeting rooms catering from 2 - 400 delegates, onsite activities including an Aerial Ropes Course, off-road driving, archery and much more- Carden Park offers a perfect solution for any type of event. To search for a conference room or meeting room availability at Carden Park please enter the details below.